Today is the last day of Naadam (literally “games”), an annual traditional festival in Mongolia. The festival is also locally termed “eriin gurvan naadam” (the three games of men), although women can participate in some these days. The games are Mongolian wrestling, horse racing, and archery, and are held throughout the country from 11 to 13 July. Women have started participating in the archery and girls in the horse-racing games, but not in Mongolian wrestling. Naadam is the most widely watched festival among Mongols, and has existed for centuries in one fashion or another, although the history is murky at best. Naadam games are obviously rooted in Mongolian martial practices and have been incorporated for some time in celebrations including weddings and spiritual gatherings. The three games of wrestling, horse racing and archery were recorded in the 13th century book The Secret History of the Mongols. During the Qing dynasty Naadam became an official festival, but now it formally commemorates the 1921 Revolution when Mongolia declared itself independent of China. Naadam was celebrated as a Buddhist/shamanic holiday until secularization in the 1930s under the communist influence of the Soviet Union. 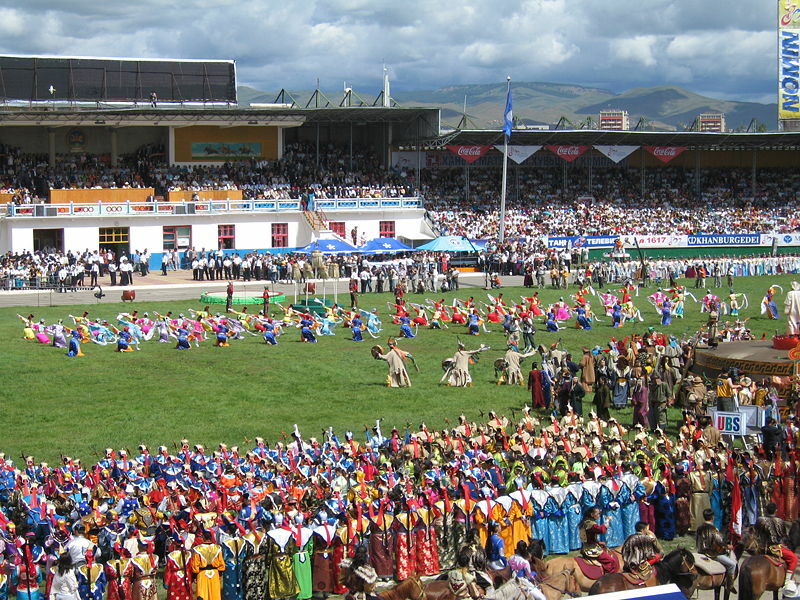 In Mongolia, the biggest Naadam is held in the Mongolian capital, Ulaanbaatar, during the National Holiday from July 11 – 13, in the National Sports Stadium. Naadam begins with an elaborate introduction ceremony featuring dancers, athletes, horse riders, and musicians. After the ceremony, the competitions begin, horse riding being the most important. 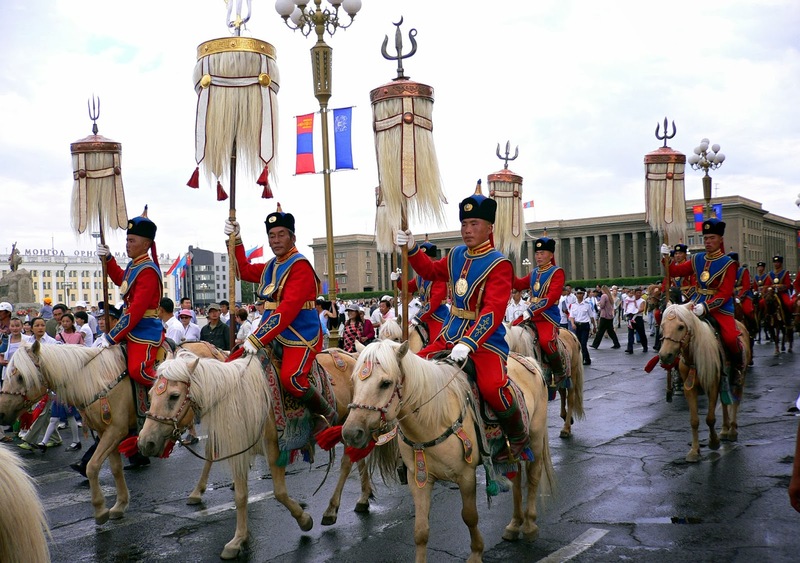 Genghis Khan’s nine horse tails, the Mongolian banner representing the nine tribes of the Mongols, are ceremonially carried from Sukhbaatar Square to the Stadium to open the Naadam festivities. At these opening and closing ceremonies, there are parades of mounted cavalry, athletes and monks. Another popular Naadam activity is the playing of games using shagai, sheep anklebones, that serve as game pieces and tokens of both divination and friendship. In the larger Nadaam festivals, tournaments may take place in a separate venue. Some of these games are similar to games I played as a boy in South Australia – which we called knucklebones. These pieces have been used since ancient times throughout the Old World. Mongolian tradition wrestling is called Bökh (Mongolian script: ᠪᠥᠬᠡ). A total of 512 or 1024 wrestlers meet in a single-elimination tournament that lasts nine or ten rounds. Mongolian wrestling is an untimed competition in which wrestlers lose if they touch the ground with any part of their body other than their feet or hands. When picking pairs, the wrestler with the greatest fame has the privilege to choose his opponent. Wrestlers wear two-piece costumes consisting of a tight shoulder vest (zodog) and shorts (shuudag). Only men are allowed to participate. Genghis Khan considered wrestling to be an important way to keep his army in good physical shape and combat ready. The court of Qing Dynasty (1646–1911) held regular wrestling events, mainly between ethnic Manchu and Mongol wrestlers. Unlike Western horse racing, which consists of short contests, usually no longer than 2 km on a fixed track, Mongolian horse racing is a cross-country event, with races 15–30 km long. The length of each race is determined by age class. For example, two-year-old horses race for ten miles and seven-year-olds for seventeen miles. 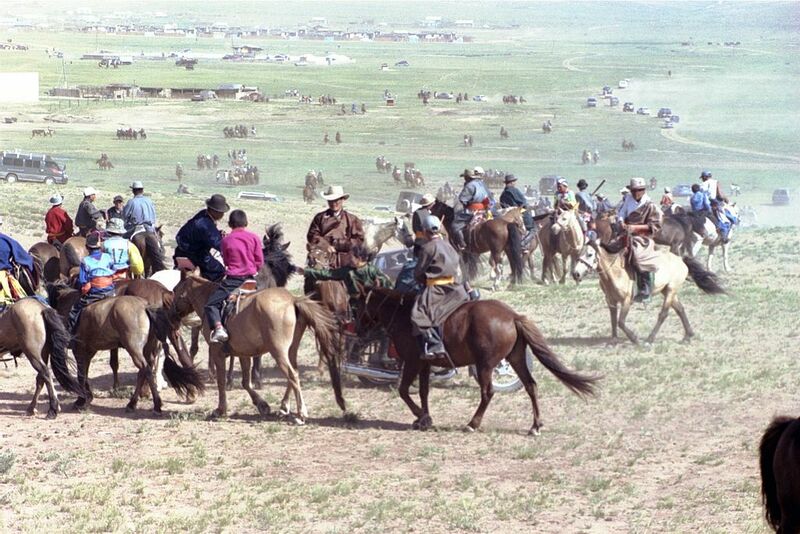 Up to 1000 horses from any part of Mongolia can be chosen to participate. Children from 5 to 13 are chosen as jockeys and train in the months preceding the races. 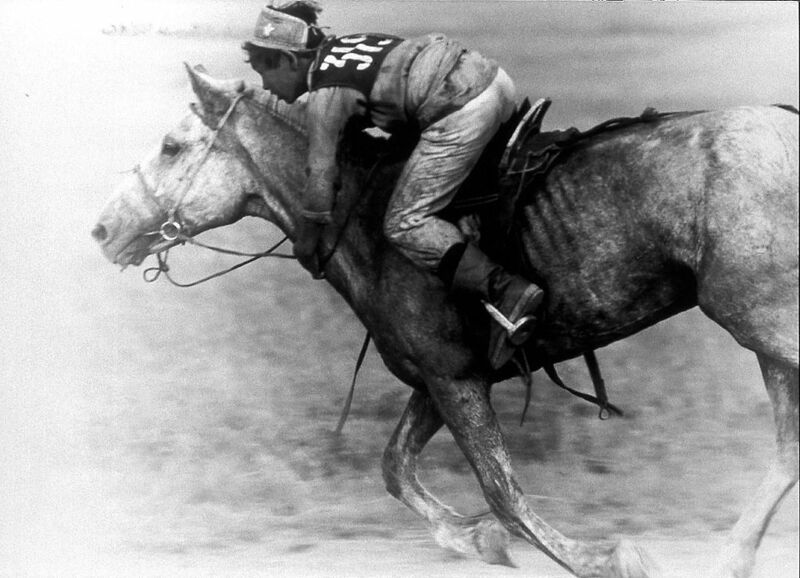 While jockeys are an important component, the main purpose of the races is to test the skill of the horses. Before the races begin, the audience sings traditional songs and the jockeys sing a song called Gingo. Prizes are awarded to horses and jockeys. The top five horses in each class earn the title of airgiyn tav and the top three are given gold, silver, and bronze medals. The winning jockey is praised with the title of tumny ekh or leader of ten thousand. The horse that finishes last in the daaga race (two-year-old horses race) is called bayan khodood (meaning “full stomach”). A song is sung to the bayan khodood wishing him luck to be next year’s winner. In the archery competition both men and women may participate. It is played by teams of ten. Each archer is given four arrows; the team must hit 33 “surs” (special targets). Men shoot their arrows from 75 meters away while women shoot theirs from 65 meters away. Traditionally the archers wear their national clothing (deel) during the competition. All the archers wear leather bracers up to the elbow on their outstretched arm, so that the deel’s cuff does not interfere with shooting. 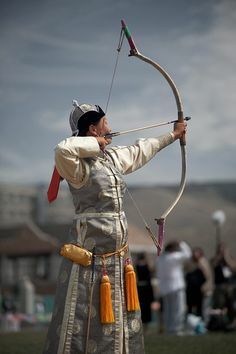 The old Mongolian bows that were used during the times of Genghis Khan were smaller than the modern weapons used at most Naadam festivals today. 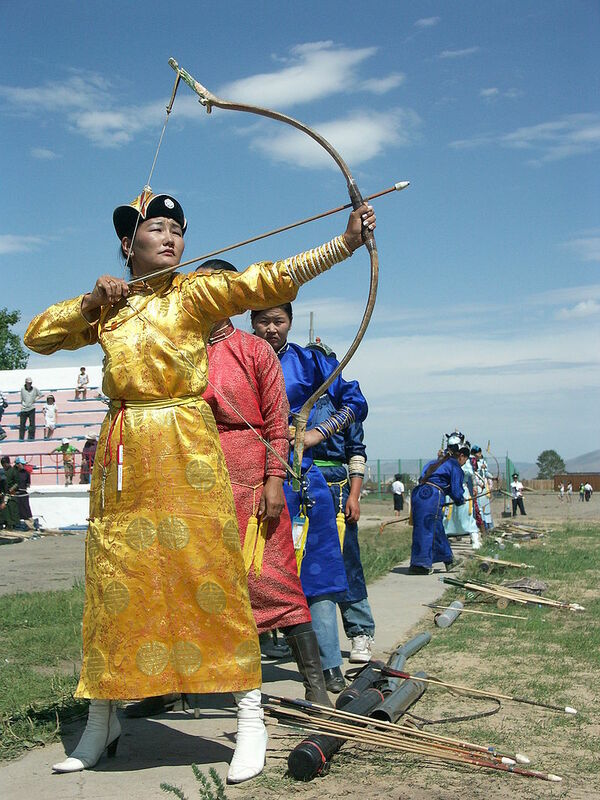 The Mongolian archery tradition may be continuous, but archery was officially outlawed in Mongolia after it was conquered by the Manchu dynasty. Manchu soldiers entered huts and broke any bows that they found. After more than 200 years of enforcement, these changes stuck and the ancient art of bow making was nearly lost, along with a majority of archery games and traditions. Modern Mongolian bows, consequently, are derived from the Chinese/Manchu tradition; they are larger and have string bridges. I have mentioned some Mongol cooking traditions before. http://www.bookofdaystales.com/mongolia/ http://www.bookofdaystales.com/kublai-khan/ . 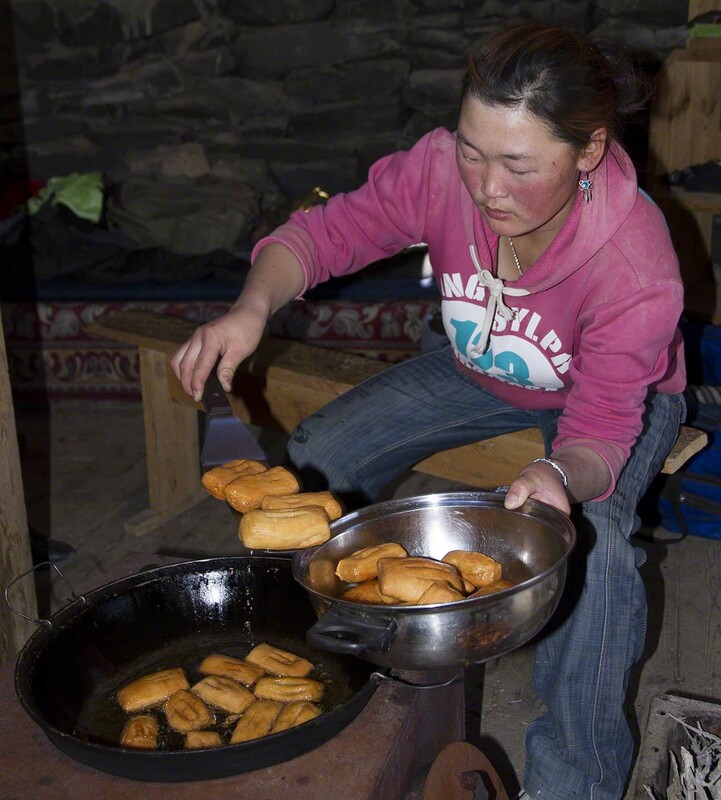 Here’s boortsog, a type of fried dough food found in many cuisines of Central Asia, and often found at festivals. They are fried dough and can come in many varieties. Some recipes use yeast; others do not. This is a plain, but serviceable ingredient list. You are aiming for a pliant, not moist, dough, so you will have to experiment with exact proportions as with all doughs. It is traditional to use mutton fat for the frying, but vegetable oil will do. They can be eaten as a snack or a dessert (with honey or butter). They can also be dipped in Mongolian tea which I will talk about in another post. Put the water in a pan and add the sugar and salt. Gently heat to dissolve. Take off the heat and add the butter and flour. Work the mixture with your hands to form a dense dough, and then knead for about 30 minutes. Let the dough rest for 30 minutes and then knead again. There should be no air bubbles. Boortsog can be shaped in many ways. For example, you can use a rolling pin to roll it out to a thickness of about 1 cm. Then you can cut the dough into strips, rectangles, or other shapes between 2 cm and 5 cm wide and 5 cm to 10 cm long. Or you can be more fancy and tie pieces into knots. Some people make small round balls. Heat your cooking oil to 350°F/175°C in a deep fryer. Deep fry the boortsog a few at a time until golden brown all over and drain on a wire rack. They can be eaten warm or cold.